The sun shone way above the blossoming meadows. No sign of elil as far as eye could see. Living as a loner rabbit was a kind of life that not many chose, yet for some reason the young doe Waterhawk had yet to find a place to settle down. Being a young rabbit was hard enough, but the fact that she had had to gather the experience of a lifetime in a short amount of time made the doe a rather proud individual. Constantly careful and focused on her surroundings, Waterhawk was hardly ever caught off her guard. However, she never got cocky. Her last companion had shown that kind of self-confidence that is bound to get an individual into a lot of trouble and he had paid dearly for it. The death of a comrade was enough of a lesson for the doe, so she had become a rather balanced character, to the point where avoiding extremes had become second nature. The loneliness was starting to get to her. Given her long months of complete solitude and the ongoing mating season, the doe was starting to feel the need of another rabbit's company. She had paused her rapid hobbling and started nibbling as she went on, at a slower pace. She had been on the move nonstop for a reason she hardly even understood. Waterhawk blamed it on her instincts - they had a dire tendency to make her take rash decisions sometimes. OT: Could you please post a character description in the thread in the rp section? It always helps to know more about characters. ot: I'm going to pull something interesting here given the fact I have two "new beginning" rps going....I'm going to say that at this point in time, Arvens' previous warren had not been destroyed as of yet. Arvens sniffed around the meadow of honeysuckle and clover. He was pretty far from his warren, but they could handle without him for the time being. He wasn't leading a patrol at that time, so he wouldn't be missed. The meadow was absolutely beautiful at this time of year and he wanted to soak in every moment of it. Arvens munched on some of the clover blowing nearby. Wonderful flayrah! His Owsla feather brushed forth and tickled his nose, causing him to sneeze loudly and spit out munched clover. He shook his head and was about to take another bite, when his ears perked up. He was not alone in this meadow. Arvens was used to these situations as Owsla and outside often. Being watched did not scare him. But what was watching him worried him. If it was another rabbit being funny, well, he'd take care of it when they got back to Thornbrush for upstaging officers was never taken lightly. Arvens looked this way and that. He firmly barked, "If you're thinking of spooking me, you got another thought coming. Show yourself!" Waterhawk did not take long to sense the new presence. Gripping on what courage she could muster, she made her way towards the silhouette she could distinguish through the tall grass blades. It wasn't a particularly frightening presence, although she could still feel that the situation had to be dealt with a certain dose of special care. Before long, she could put her paw on it - what had bothered her little stroll was nothing else but another rabbit. What attracted Waterhawk's attention right away was the feather that seemed to be pestering the buck. She decided to keep a low profile for the time being in order to figure out which approach would have been the most fitting. However, as he spoke up she pricked her ears and chuckled full-heartedly. She hopped around in circles, keeping the spirals as ample as possible, before she finally came to a halt in front of the Owsla officer. She rubbed her front paws against her nose and giggled lightly, staring the buck right into the eyes. A daring doe she was ,indeed, but her instincts had not betrayed her before. "I had no such intention, I can assure you. I was only making sure that you were not something that I should dodge, instead of greet." She spoke charmingly and on a tone that was perfectly respectful. Arvens looked up and down the newcomer that had appeared in front of him. She was bubbly and free, really no danger to him. 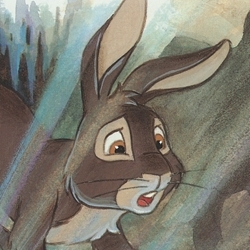 She wasn't a rabbit he had seen before, granted he likely didn't know every rabbit in Thornbrush, but he knew a good number of them. In any event all the rabbits know of the Thornbrush officers, so being unaware of what to do was a good sense she was new to the area. "You're not from around here are you?" he said, pointedly. "Where are you from?" "Oh, that really is too far away to matter at this point. I've been travelling for so long that even trying to picture the beginning of my journey seems close to impossible." She spoke rapidly. Her eyes drifted from the Officer's eyes to the feather that was so uncannily adorning the buck. "How did you get a hold of that?" She hopped towards him and sniffed the feather curiously, but stopped herself before touching it and backed away an inch. "Excuse me, I have terrible manners. I am Waterhawk. Nice meeting you, ..." As she waited for him to introduce himself, the doe thought only about how she did not feel particularly intimidated, in spite of the buck's size and possible high rank. Anyways, mind if I jump in? Serendipidous that I have an unused character already made, but I'll lay low until the story comes across a good spot for... a new character to join, seeing as it's still focusing on Waterhawk. Yes. Yes. Do continue, just know that I am hovering. OOC: I'll wait with joining too, till there will be a proper time to introduce new character. Arvens blew at the feather and cast it out of his eyes. "All officers of the warren wear one for easy identification. You'll see its not unusual. Am I to gather you will join us then, Waterhawk?" asked Arvens rather quickly. "If you do decide to join us, do realize I cannot predict where you will go, who you will sleep with or any of that sort. Also, you will be examined rather closely once you get in the burrow. Let's just say some are a tad too paranoid of the white blindness and therefore every newcomer, large and small, young and old are examined by our chief healer. Just bringing it up as you'll find it most unusual and uncomfortable, but its best not to argue or you will likely be thrown out." OOC: The more, the merrier! I wanted to make them have some sort of connection, Speedwell, but as the story moves on, I'll see how it fits into it. Perhaps, long generations could do the trick XD I was just so very attached to how they described the fish hunt that it stuck with me. And the name fits, so why on earth not? Anyhoo, whenever you're ready (it goes for both of you, Speedwell and Myrkin), feel free to hop in! Not really much of a joker, I see. Waterhawk thought idly. She cut down on the amount of enthusiasm she exhibited and put on a rather serious expression - an unusual look for her since it did not entirely fit her bouncy personality. "I was looking for a place to settle down in, yes. As for the examinations, they don't sound particularly friendly, but I do understand their point all the same. Were you on patrol? If so, I guess I could join you. I don't mean any harm, but two rabbits can do the job faster and then you can take me back to your warren." She lolloped away for a bit, nibbling cautiously as she waited for Avens to respond. "You may follow me when you're done nibbling," remarked Arvens dryly, watching the doe. He added moments later, "As for a patrol, I was not on one, but others were. I'll take you to the chief healer immediately. Follow me, don't talk to any rabbit who asks who you are, where you came from or any of that. You say the wrong thing, rumors spread quickly and you'll find yourself in a bad predicament. You seem nice, but not all rabbits are nice at Thornbrush. If you came from one of those "nice" warrens like that Watership Down one I've heard about, well, you're in for a bit of shock here as things don't work that splendidly here. If I haven't totally scared you away, follow me." Arvens peeked out of the flowered meadow, looking down the dusty paths. Seeing no rabbits, he hopped out and turned east, hopping slowly. Yarrow had seen more agile days. This was quite clear to him as he stumbled through the forest, scratched up and tired from so much walking. It must have been miles he had traveled with his fiery, indignant drive sending him away from his old home. He had seen far too much abuse in the short time he had lived... and now it was high time he pack it up and find others to accept him. But how could he find others if he could not even find his way around this bush, he wondered as he stumbled headfirst into a leafy sticker bush, getting tiny little clumps all hooked in his fur. "Fantastic," he sighed to himself, leaning over to pick the stickers out before anyone could see how ridiculous he looked. "This is exactly what I was aiming for- a life of solitude, like an embleer hlessi. Frith, strike me now." His next tug from the fur of his back paw sent him off balance, and tumbling down a slope, into the full view of a dirt path. "Lillypads!" he exclaimed, for lack of a swear word. Arvens was about to look back and see if the doe had indeed followed him into the open, when I sudden crash to his left took his interest off the doe for a moment as a young buck crashed through the bramble and onto the road. He looked like a spiky pincushion, but it was definitely a rabbit. The buck called out loudly, obviously angry, and not any buck that Arvens had seen before on his rounds. He quickly went to his side. "Are you hurt?" he asked rather quickly, peeking over all the sticklers on the buck's fur. "I haven't seen you before....do you belong to Thornbrush by chance?" Yarrow spun round at the sound of an unfamiliar voice, frightened at first, before calming himself and collecting his wits. "Hurt? No, no, nothing but my pride," he responded gently, and then shaking his head in response to the other question. "As for Thornbrush- not at all, have never heard of it. I'm on a journey, see, but I got rather turned around, and now here I am all covered with stickers, and really it's..." he paused a moment, noticing that this other buck must not be too interested in the details of his journey. "Well, I'm Yarrow." He gave a dazzling flirtatious smile, his friendliness pouring out from inside of him. "And you, sir? Out here on your own?"